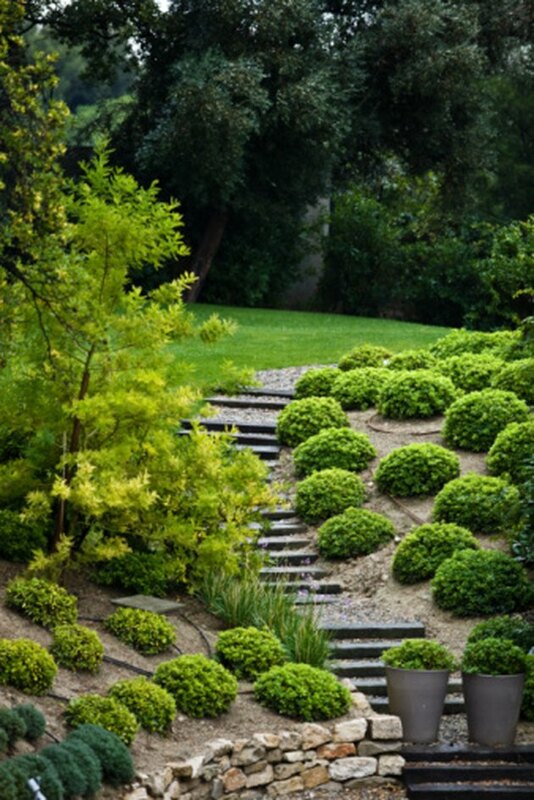 Landscaping a sloped yard is a challenge for beginner and experienced landscapers alike. Besides creating an aesthetically pleasing yard or garden, landscapers have to take into consideration serious issues such as soil erosion, drainage and water runoff. With a little preparation and preplanning, you can create an attractive landscape design for your sloped lot to mimic nature. Use your creativity to incorporate the natural curves and slopes in the design while creating functional space for decorative features. Landscape a sloped lot with trees and shrubs. Walk the slope to get a rough idea of the depth of the fall and severity of rise. Draw a basic sketch of the sloped lot on graph paper. Mark on the paper the areas where the slope is the least and most steep. Mark existing features on the diagram and determine whether you wish to work around them or remove them. Note the amount of sunlight the different parts of the sloped lot receive. Install a drainage pipe at the foot of the slope to carry excess water away from the space to a soakway or swale. Dig a 10-inch-deep and 6-inch-wide trench over the area. Compact the base before spreading 2 inches of crushed gravel. Lay the 4-inch-wide perforated pipe over the gravel, with its drainage holes facing downward. Lay pipes all along the length of the trench until the end that opens into the designated outlet spot. Cover the pipes with agricultural fabric before backfilling with soil. Install terraces over the steepest slopes to provide growing space, prevent erosion and runoff while adding interest to the sloped lot. Dry-stack stones over each other to form 3-foot-tall retaining walls over the steepest slopes with level ground in between. Level the soil between the walls and incorporate 2 inches of organic compost and quality topsoil to enrich the quality of soil for desired plants. Plant ornamental low-maintenance shrubs on the terraces to provide instant color and prevent runoff. Remove existing grass from the slopes and plant a ground cover such as clover or English ivy that easily grows up an incline. Depending on personal preference, plant seeds or seedlings of the desired plants and cover with mulch to keep them in place until established. Plant water-loving trees such as willows and Easter red cedars at the base of the slope to absorb excess moisture. These trees do not die or decline if their roots stand in water for long periods of time. Install large boulders around the slope to break the monotony and add character and depth to the space. Embed one-third of each boulder into the ground to provide it a stable footing. Pack dirt around the base of each before planting climbing ivy over it.